After taking 2017 off from TV’s great Christmas party that lasts from Halloween until, who knows, some time vaguely after Valentine's Day (? ), Lifetime is back in the seasonal spirit with their own original Christmas movies. Under their It’s a Wonderful Lifetime banner, the network that loves Yuletide cheer as much as it loves a nostalgic biopic is unveiling dozens of original movies in the traditional model. Many of them are currently available on their website for those with a cable subscription. To celebrate the season, here's a look at some of their past successes. Lifetime let us know their most popular movies from earlier in this decade and we took a stab at ranking them. Find out which one is the star on the top of this particular Christmas tree, and if you can't get enough cable channel holiday films, check out our ranking of Hallmark's best Christmas movies. This was before Lifetime figured out exactly what its Christmas movies should look like and, well, it looks more than a little cheap. Ironically it's the story of a billionaire (Bruce Davison) who wants to give away all of his money at Christmas, so he enlists the help of Ashley (Kari Hawker), an unemployed woman who hates the holidays. Of course she helps everyone and falls in love. I have never seen getting rid of money look so boring. There's delicious Christmas cookies and then there is whatever this is, which is just a tired cookie cutter production. 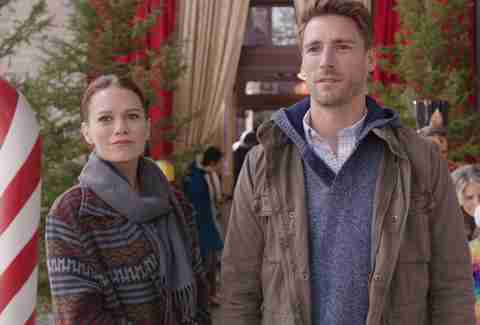 Jenna (Bethany Joy Lenz) and Kevin (Andrew Walker) are coworkers at a blog who hate each other. They get stuck on a holiday assignment and get stranded at an old country inn that they decide they're going to save from ruin. Thanks to working together and some Christmas cheer, they end up falling in love. There is definitely a Christmas movie mold, but this movie is so stale it seems moldy. You think you want to see what Jason Priestley directing a Christmas movie is like, but you really don't. It sort of looks like a bland, uninspired bit of cardboard masquerading as an actual movie. Crystal (Amy Acker) is a rich socialite who finds a girl's letter to Santa where she asks for someone to give her dad a reason to smile. She decides she should be that reason and goes after the dude (David Haydn-Jones). It's both creepy and robotic. Now, what would Shannen Doherty's Christmas movie look like? This is basically Sweet Home Alabama, but at Christmas. Katherine (Hilarie Burton) works too hard, so she decides to take her young son to her hometown for a Southern-fried bayou Christmas. She runs into her high school sweetheart, Caleb (Tyler Hilton), who tries to heat things up again, quite successfully. Even with the untraditional southern flavor, this Christmas movie is still a little bit hokey. Nope. I want nothing to do with Santa Con, that annual horror show of drunk suburbanites taking over bars and pubs in urban areas for their own selfish, gutter-puking ends. Yes, this movie about a con man (Barry Watson) masquerading as a mall Santa who promises to reunite a kids parents has nothing to do with the frat boy holiday. It even costars Melissa Joan Hart and Jaleel White, but I still can't get over the name enough to stomach it. 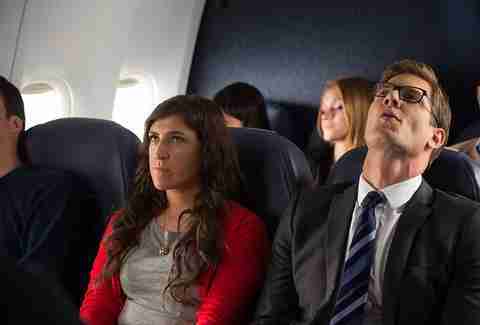 We've all sat next to someone really annoying on a holiday flight before, but it was never as heated between what happens between recently-dumped Stephanie (Mayim Bialik) and Michael (Ryan McPartlin) who is about to propose to his girlfriend over Christmas. When their flight is diverted, the two end up sharing the last remaining room in Boseman, Montana. You know how this goes, a little bit of mistletoe goes a really long way. But just when you think things couldn't get any worse, there is a nice twist at the end that gives us the happy ending we were all hoping for. Meeting your partner's parents for the first time is always hard, which is why we have movies like Meet the Parents and The Birdcage. Now if you mash those together and make one set of parents Santa and Mrs. Claus (Cheers alumnae George Wendt and Shelley Long) you have this movie about a man (Lucas Bryant) who has to keep his famous parents' identity a secret around his muggle fiancé (Kassia Warshawski) and her family. Yes, it's silly, but it has a winning verve that serves it well. It's beginning to meme a lot like Christmas when Grumpy Cat (voiced by Aubrey Plaza, natch) hates the pet store in the mall she lives in, especially when all of the other animals keep getting bought before her. 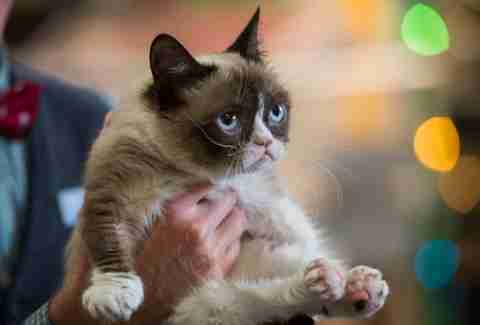 One day Chrystal (Megan Charpentier) shows up and can actually talk to Grumpy. The two of them solve the crime of an expensive dog that was stolen from Grumpy's store and keep her pet store from closing. Dark, chaotic, and entirely bizarre, this is a Christmas movie for those who are entirely grumpy about Christmas movies. 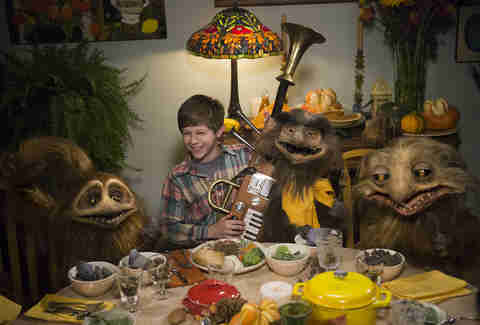 This is actually a Thanksgiving movie and, um, boy is it something. Tim (Graham Verchere) and Annie (Genevieve Buechner) get lost in the woods while on vacation visiting their Aunt Cly (Mary Steenburgen). There they find these weird creatures that look sort of like really hairy turkeys, or maybe more like birdlike meercats. Anyway, these Muppet creations help the kids thwart a local businessman's plot to steal Aunt Cly's farm. This one gets points for being different, even if the shag carpet turkeys might give the kids nightmares, or at least scare them off meat. If you thought Penelope Spheeris, who directed Wayne's World, would have better things to do than make a Christmas movie, you'd be wrong. Kate (Torrey DeVitto) is a psychiatrist who is treating a man (Callard Harris) who hit his head and now believes he's actually Santa Claus. But wait, is he? Is it mental illness, or is this dude on to something? A twisted version of the familiar tale, The Real St. Nick has laughs and heart to spare. Yeah yeah yeah, we know the story. Wendy (Ashley Williams) moves to the city to make enough money at Christmas to save the family business and ends up falling in love. Snooze. But wait. Ashanti plays Teanna, her Miranda Priestly of a boss. Thanks to her nastiness and a prominently featured trio of shirtless Santas, this special is powered not only by Christmas cheer but also by some diva tantrums. Ashanti never made getting coal look so much fun. A case of mistaken identity, the coming of the retail apocalypse, and a whole ton of former sitcom stars make this movie an absolute delight. Heather (Fresh Prince of Bel Air's Tatyana Ali) is tasked with closing all of the failing businesses at a down-on-its-luck mall. One day her niece asks the mall Santa to give Heather a boyfriend. Heather starts falling for Santa, who she doesn't know is played by Ryan (the hunky Brendan Fehr), who's running one of those failing stores. Come for the romance, but spotting Jackée Harry, Kim Fields, and Jasmine Guy among the supporting players will get you drunk with joy faster than three cups of egg nog.